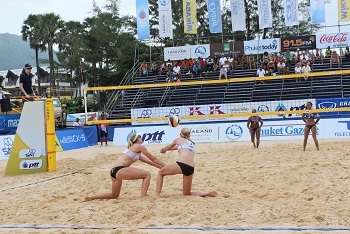 2 player volleyball (doubles) can be very challenging. Take advantage of any chance you have to play "two on two". Especially if you want to improve at playing sixes, doubles will make you a much better player. The obvious advantage of learning to play volleyball by playing doubles is you get more touches on the ball. More touches mean more repetitions which mean more opportunities to improve skill. Since there are only 2 players on a team in doubles, there is a whole lot more court to cover. Players must constantly anticipate the opponent in order to figure out where they need to be to make the play. You dont just improve at anticipating your opponent. You also improve anticipating your partner. 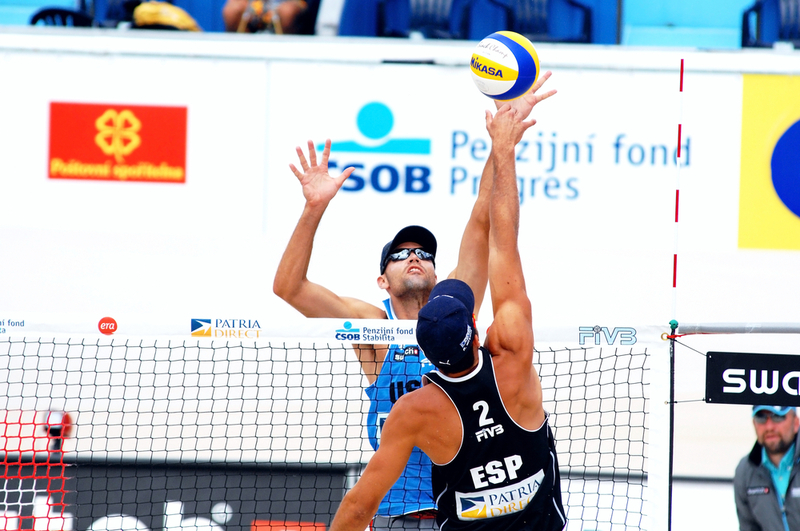 For example, if you make a poor pass, you will anticipate your partner making a poor set. The more ready you are for your partner to set you poorly, the better you will be at making the next play. The fact that each ball that comes over the net is going to be either yours or your partners helps you to expect to make the play. Just think how this will help your indoor game. Here are a couple more ways you'll be better at anticipating in sixes. 1. If your teams setter cant get to a poorly passed ball, youre more ready to help out. 2. Since you have experience playing doubles, youll have a much larger range for making plays. In sixes, many players dont develop a larger range to make plays because its easy to cheat and get in position. There's more people on the court to cover space, so players aren't challenged to anticipate and make plays. To win in doubles, you must develop skill to cover longer distances on the court. This improved range will carry over to playing sixes. Doubles will help change the mindset of guessing where to play defense and committing too early to the position that's best to be in. Defensive players that commit to a position early will often get burned because the attacker is more easily able to figure out what the defender is trying to do. Making plays in volleyball is all about positioning. Doubles volleyball has the great advantage of teaching players to fight real hard to get in position. They must fight hard to get in position because of the range they must cover to make plays. For example, if a player gets served deep and they want to attack at the net, they will have to take many steps to get to the net and attack. Developing this skill is a huge advantage for playing sixes because most outside hitters dont attack very well if they pass the ball. A common strategy is to serve the outside hitter so they cant get a good attack. If you play doubles, you wont have any trouble in this situation because when you play doubles youll do this all the time. If you have real poor volleyball skills, you can play doubles and improve all your skills at the same time. For example, if you get served, you must pass the ball to your partner. Your partner sets you and you must attack. If your partner gets served, then you are the setter. If the opponent is attacking you must either dig or block. You are constantly using all volleyball skills when you play 2 player volleyball. You must be good at just about every skill. If you don't develop your skills, you won't win. Doubles has the advantage of specializing by skill. You can specialize when you play sixes, but not like you can when you play doubles. When playing doubles youll get in more repetitions for that one skill. For example, if you wanted to work on your blocking, you can block the entire time while youre partner plays defense. Or if you wanted to work on your passing, you could take up most of the court in serve receive. If you wanted to work on your setting, you could then let your partner pass most of the balls so you could set. If you wanted to work on hitting, you could take up most of the court so you could pass then get set to hit. Or if your partner gets served, you could hit on 2. 2 player volleyball will definitely improve your communication skills. Again, each ball is either going to be yours or your partners, so its very important to constantly communicate. Players must communicate during each serve receive in order to know whos passing. When serving, teammates must communicate on what defense they are going to play. Advanced teams will have one player at the net signaling where they are blocking while the other player plays defense depending what was signaled. There isn't a coach around to constantly correct your mistakes in 2 player volleyball. Errors can also be more obvious in doubles so players can develop self-confidence and learn to solve problems on their own. You should take advantage of any chance you have to play doubles because this is an opportunity to think for yourself and figure out how to win. Strategies are much more obvious in the doubles game. For example, if an attacker is facing a blocker at the net, it will be more obvious where to hit the ball when compared to sixes. In 2 player volleyball, your partner will likely yell Line! which means to attack the ball down the line. This option can be obvious when the defender is playing defense in the angle. Making a call like this in sixes isnt as obvious. After playing doubles for awhile players start to think more and more about strategy. This mindset will carry over to playing sixes which results in a much smarter sixes player. Having Fun Playing Volleyball on the Beach! 10. Doubles is more fun! The more fun players have, the more focused theyll be. The more they focus, the more theyll improve. 2 player volleyball teaches you to be more involved in the game. You and your partner must decide how to play and solve your own problems. This way of learning to play volleyball is more fun than constantly relying on a coach to help you out and solve your problems.